In this true and moving story, Alter Wiener, a teen survivor of five Nazi prison camps during WW II, transports young readers back in time when an unexpected person demonstrated moral courage in repeated acts of kindness toward him. 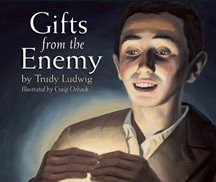 Gifts from the Enemy, written by Trudy Ludwig and illustrated by Craig Orback, shows how acts of social justice and kindness can change lives. not once but 30 times for me? Why me?" Parents and teachers will find this story a valuable and timely resource to help children understand in an age-appropriate way the dangers of hatred, stereotyping, and prejudice. A personal note from Alter Wiener, thought-provoking discussion questions, kid-friendly activities to promote kindness, and more are included.